Surprise, Snarklings! The Lady of the Manners is finally rousing from her winter hibernation to return to the main Gothic Charm School site! (All right, as those who keep an eye on the Gothic Charm School tumblr know, it wasn’t really hibernation, but more a state of being overwhelmed with a lot of things happening at once.) But that’s not the important thing! The important thing is that it’s time for a new post at Gothic Charm School! I was wondering if you had any goth appropriate ideas for gifts and/or dark romantic dates for Valentine’s Day? P.S I inboxed you this question via your Tumblr but figured I might as well kill two birds with one stone and did not see many posts on the site regarding Valentine’s Day. This may come as a surprise to some of you, but the Lady of the Manners adores Valentine’s Day. Chocolate! Roses! Pink and red accents to things! Giving silly cards to your friends and loved ones! Yes, it’s overcommercialized; yes, it can make people keenly aware of whatever their relationship status is, for good or for ill; but don’t give into bitterness or despair, Snarklings! Valentine’s Day is for showing affection and kindness to people that matter to you, not just for romantic gestures. Look for the silliest box of kiddie Valentine cards that you can find, then send them to people you think need a spot of whimsy in their life. Send your friends links to pictures of adorable animals that make you think of them. Valentine’s Day is what you make of it, and it’s equally about celebrating friendship and platonic love as it is about romantic love. But to return to A.R’s question, gothy gift and date suggestions! 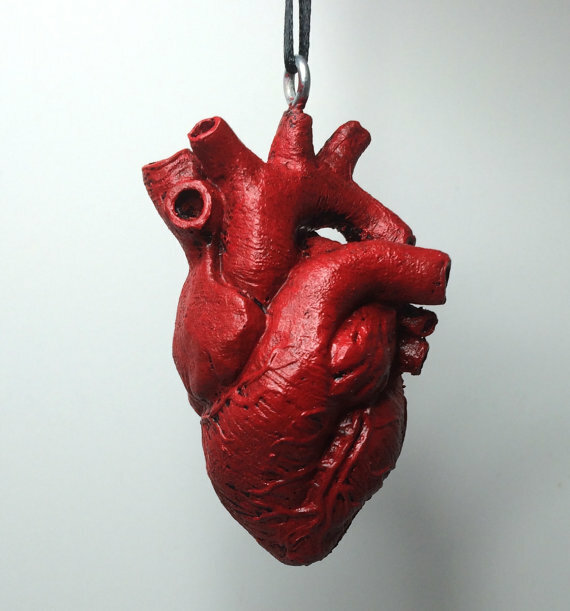 The anatomical human heart ornament from Dellamorte Co. adds an appropriately macabre twist to the traditional “I’ll give you my heart” sentiment. 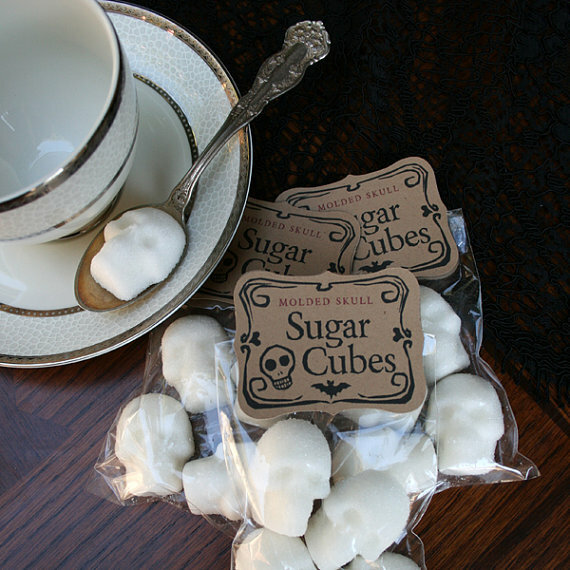 Sugary skulls from Dem Bones! Sweet and creepy; the Lady of the Manners likes to keep a supply on hand for when her coffee or absinthe needs an extra spooky flourish. Some sugar skulls, a fancy tea cup you found at a thrift store (you can decorate it with bake-at-home china paints for an extra-personal touch), and ta-da! A sweetly spooky gift for your sweetie! 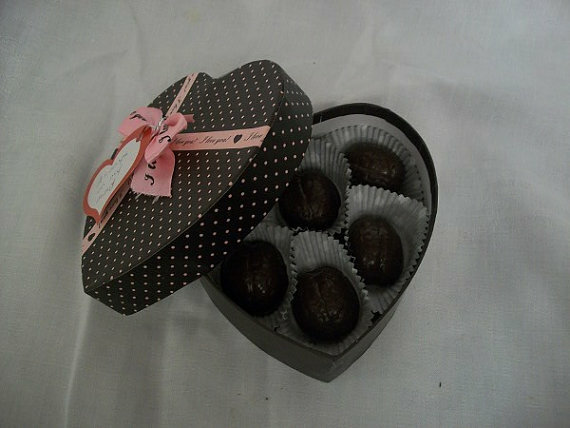 Or perhaps some chocolate brains, made with fair trade cocoa? The Gift Crypt can help you with that! 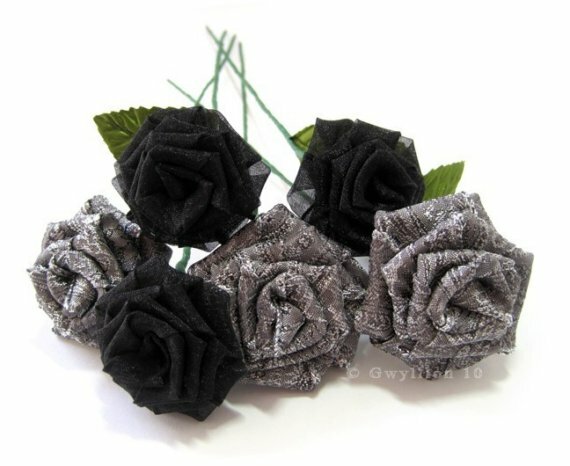 Offer your valentine a bouquet of black and silver fabric roses from Gwyllion, to show that your affections will not fade and wither with time. 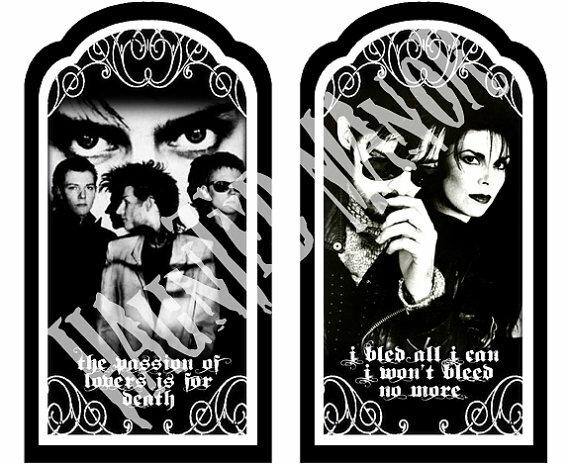 A set of devotional candle labels of the patron saints of goth would possibly earn you goth points (which don’t exist, you all know that) while being appropriately gloomy and romantic. 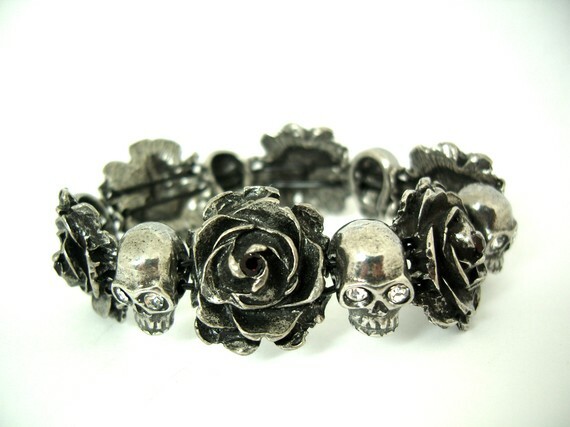 A bracelet of skulls and roses is an elegantly macabre way to show your affection. 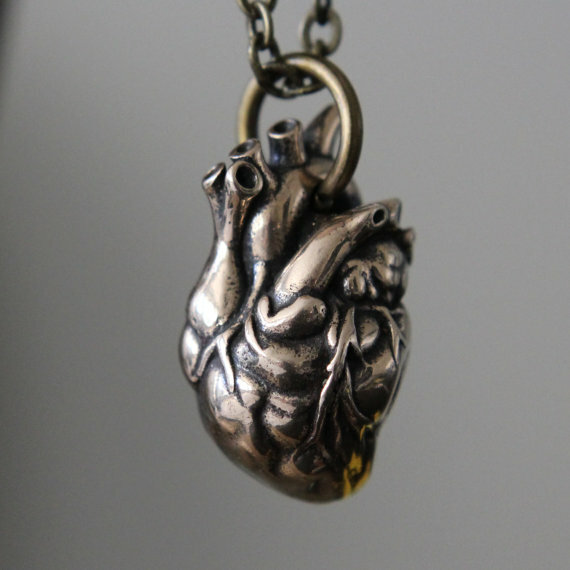 Perhaps a anatomically-correct silver heart necklace would express your feelings? Of course, mail-order is not your only option! Make your own cards for your sweetie(s)! Because it really is the thought that counts, and even a simple folded piece of paper with a heart drawn on it and a heartfelt message inside is a sweet something to treasure. A little gift bag, filled with things you know they’d like. This doesn’t have to be wildly extravagant! A paper bag with a hand-drawn heart, filled with books or DVDs that you selected for them (from thrift or used book stores), some packets of nice tea or cocoa mix, pretty bits of lace or ribbon that they could pin onto a jacket — again, the important thing is that you spent time thinking about them to put the gift together. Bake favorite treats! Cookies, cupcakes, brownies, popcorn with fancy flavored salts or sugars — these things are classic gift ideas for some very good reasons, Snarklings! But what about dates? Special gothy events? A stroll or picnic through your local graveyard. Be respectful, but spending time wandering through the graves, admiring the artistry of the markers and pondering the lives and loves of those resting there, is something that should make any dark romantic’s heart flutter. If the weather is too inclement to have your picnic at the graveyard, hold it inside! There is something quirkily charming about having a picnic indoors; blanket on the floor, dishes of specially-selected nibbles spread around, and no risk of bugs. Plus, an indoor midnight picnic is MUCH easier to organize. Go to a local park and play on the swings! Visit an art museum! Find out if your city has any interesting ghost tours! Movie date! No, not to the local theatre (unless you’re lucky enough to have someplace that is showing a classic horror movie), but at someone’s abode!. That way you can control the atmosphere and ambience (velvet throws, pillows, flickering candles, appropriate nibbly foods), and ensure the film is one to your tastes. The Lady of the Manners highly recommends something like Only Lovers Left Alive, The Addams Family and Addams Family Values, episodes of the old Addams Family or Munsters TV shows, or The Corpse Bride for spooky romance. Read to each other. Select some poems by Edgar Allan Poe, Lord Byron, Shelley, or Keats, or unearth classic ghosts or vampire stories, brew some fancy tea or mix up a concoction of sparkling water, pomegranate juice, and rose syrup, light some candles, and while away the hours taking turns reading aloud. What if your special someone lives far away? Set up a Skype call and have your romantic date via the magic of the internet! You’ll still be sharing the experience together, and that’s the most important part. The Lady of the Manners hopes these suggestions have kindled a dark flame in your spookily romantic hearts, Snarklings. What are some of your ideas for Valentine’s Day? (Besides hitting the post-holiday sales to stock up on half-price chocolate; that’s a traditional event in the Lady of the Manners’ world.) Talk about it in the (moderated!) comments! I think I’ll be going for Carnival instead. There’s something fascinating about masquerades. Another good movie for feel goods with a slightly dark undertone is The Book of Life, which just came out on disk. All of these sound like lovely ideas, as we were already planning on an at home date, I’m going to see if we can make a yummy indoor picnic instead. All the fun of a picnic without the sun! And that way we can watch a movie as well. This will be the year that I attempt paper roses, as they have been on my crafty to do list for a long time. I love the “silk” rose petals you can buy by the peck at any dollar store; spritz those with some fragrance like rose water or some other scent you may like, and sprinkle them around for a romantic effect. Floor, bed, even bathtub! They aren’t as messy or expensive as real ones, and you can enjoy a bouquet of real roses in a vase. The best valentine’s day I had with my beloved boyfriend, we put a quilt on the living room floor in front of the fire place (it’s a gas fire, but it has flickering flame effects hehe!) and ate pizza and melt in the middle chocolate puddings. The first twilight movie was on TV so we put it on and snarked about how bad it was (sparkly vampires and insipid teens LOL etc). It was a really special and personal night in =]. No plans for this year so far, but I’m very lucky to have him in my life! Its so funny that you mention Corpse Bride, because I, as a perpetually lonely person on Valentine’s Day, spend the evening watching that movie with a nice rose tea every year since the film’s release.